7 Responses to "Photo: New Official Photo of Robert Pattinson as Georges Duroy"
I. LOVE. THIS. PICTURE. I love the snyposis below it too. I spy “erotically charged,” “seduction,” “the rise of Georges,” “passionate trysts.” When oh when are we going to get a U.S. release date for this movie?! I love this man! I’ll have to see the film several times because the first few, I’ll just be staring at him! Have you noticed that he’s a little shy talking about this film in interviews? I need to see the movie now more than before. @Linda, I think he’s not shy, I just think people find Breaking Dawn more interesting…yeah, right. Amazingly hot photo! movie description is hot too! After reading the book: I am so anxious to see this!! Rob will be stunning in it and move way beyond Breaking Dawn in his sexiness. No pg-13 on this one! If the offical photo is released then a opening date must be close behind????? Hope of all hopes! This is the movie that I’m MOST anxious to see this year!! and see again and again and own! When are we going to see an official photo of Holly Grainger as Suzanne Rousset? The only ones we have seen are of Robert, Uma, Kristin & Christina: we have yet to see one of Miss Grainger. She is, after all, supposed to be one of the female leads of this movie; the publicity ought to reflect this. 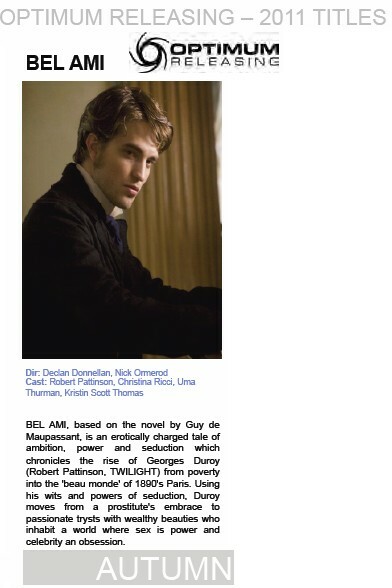 Bel Ami production is really toying with us and I don’t like it. They say it will be released in May, then summer, then fall, then nothing. What the hell??? What is the hold up with letting us know a U. S. Release date on this film? And why aren’t they promoting it, taking it to festivals, etc.?? I’m starting to worry that we will never see it. They are going to really piss off millions of Rob fans if they don’t release more pix, a trailor and a release date soon.